Home > Sledding > What Is Backcountry Sledding? The terminology ‘backcountry sledding’ simply refers to sledding in an area which is isolated, remote and underdeveloped in much a similar fashion to ‘off-piste’ ski-ing. The main benefits are that the nature of the terrain you’ll be sledding on will be far more fun and varied than what you’d be accustomed to on as opposed to, say, snowboarding on an Alpine slope in winter. Therefore, it can be a lot more challenging. It can also be a lot more dangerous too given that it’s off the beaten track and away from the more controlled environments of the snowboarding slopes so you really have to know what you’re doing. However, if you’re a proficient snowboarder, it’s certainly a far cheaper way to get your thrills and spills with it being very much a ‘do-it-yourself’ activity. Backcountry sledding involves a combination of directional control, flotation, padding and a binding system. The sled is constructed of a strong plastic material with the snow-side surface having various grooves to help with directional control. 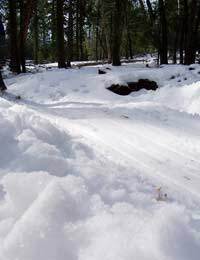 Because of its plastic construction with its large amount of snow side surface area, this makes it ideal for keeping the sled afloat in deeper snow conditions which you’re likely to encounter more when sledding in a backcountry area such as open-mountain bowls and gladed steeps which are powder-filled. Therefore, because of a lack of a metal edge and the fact that they are designed for a lower centre of gravity, it is harder to directionally control a backcountry sled where the snow is packed tight or on icy surfaces which are where snowboards and alpine ski-ing come into their own. Modern backcountry sleds also have a binding system which usually consists of a belt strap which is attached to the sides of the sled. With the sledder operating from a kneeling position, this strap is then attached to the sledder’s calves or thighs and connected to the other side of the sled with some form of buckle device. Unlike snowboards, backcountry sleds also have foam pads which are glued onto the sled enabling the sledder to kneel and these foam pads are there for shock absorption purposes. One of the most important issues to be aware of is that like many fun winter snow sports in which you’re travelling at great speeds, the risk of injury is never too far away and with sledding in particular, head and abdominal injuries are the most common and these are predominantly the result of collisions with a fixed stationary object. The risks become even greater if you’re backcountry sledding simply because the environment is less controlled and often more unpredictable so extra care must be taken. Furthermore, in a similar fashion to off-piste ski-ing, it’s important that you check your insurance policy very carefully as you may find that you’re not covered for backcountry sledding which could be catastrophic if you were to suffer a serious injury whilst sledding in a location where you’re not insured. The important thing is to know what you’re getting into first. Speak to others who have been backcountry sledding and take your cues from them. It’s all very well to want to seek out new adventure sports away from the tried and tested, but you should not compromise your safety in doing so.